"Look! That cloud looks like a unicorn; I wish I could ride it!" Yes, my middle daughter has a crazy imagination and slightly unrealistic expectations, but really who hasn't wanted to touch a cloud? My kids may see shapes of all sorts in the clouds, and of course, they like to imagine they are bouncing on fluffy white clouds. I used to as well, when I was their age, not recently (at least not too recently). Sometimes it is hard to believe what looks so solid is really nothing more than water. 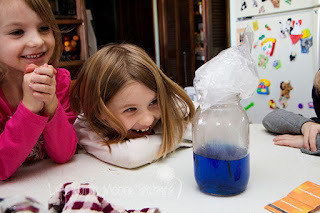 This hands-on science experiment, making a cloud in a jar, is a fun way to "touch" a cloud. Fill the mason jar about 1/3-1/2 full of water, add food coloring now if you want. 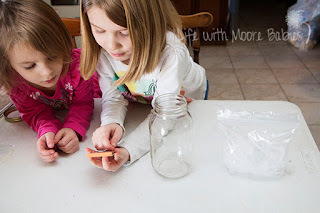 Next, you need an adult to light a match and drop it in the jar. If your kids are anything like mine, they will want to do this themselves; I didn't let them, but it could be a good time to review fire safety too. Quickly cover the jar with the baggie of ice and watch your cloud develop. 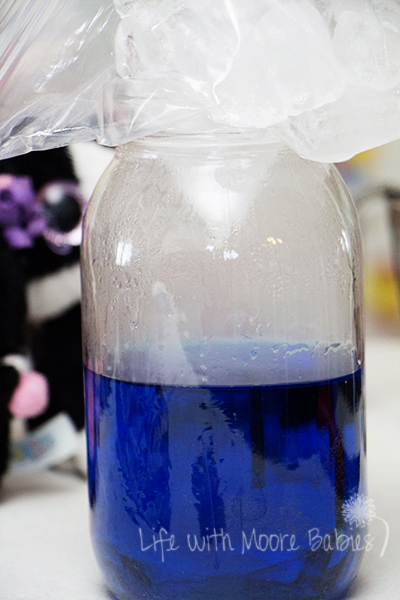 You can see how the top half of the jar has become cloudy; that's because it is filled with a cloud! You made your very own cloud! If you are like my kids (or me) you are overly excited and just want to touch it. So after you have a decent amount of cloud you can remove the Ziploc and feel the cloud float out over your hands. Let me tell you, this was quite the realization for my little ones who thought they could ride the puffy, unicorn shaped clouds! 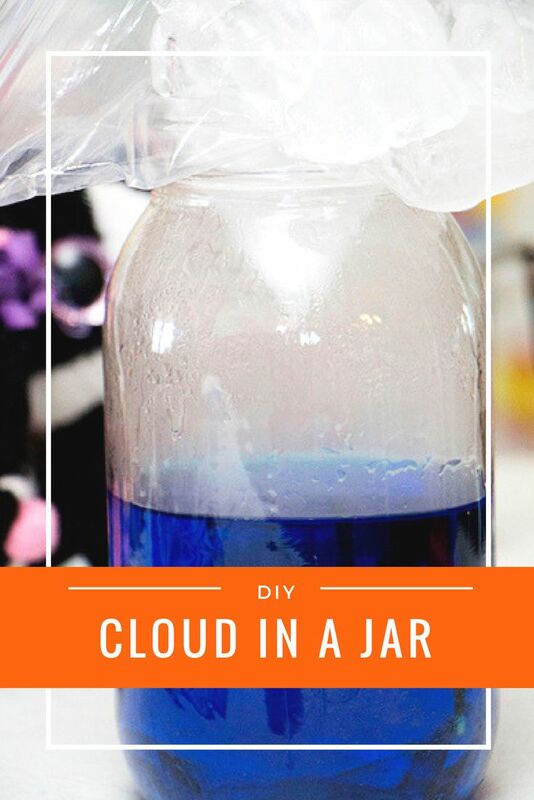 Why does this form a cloud in a jar? Clouds are formed in the atmosphere when warm air rises and cools off. Because the cooler air cannot accommodate as much water as the warmer air; tiny water droplets condense onto dust in the air. These water droplets weigh so little that they continue to float in the atmosphere. When they combine with many, many more droplets you see a cloud. Or the short version, clouds form by the condensation of water. 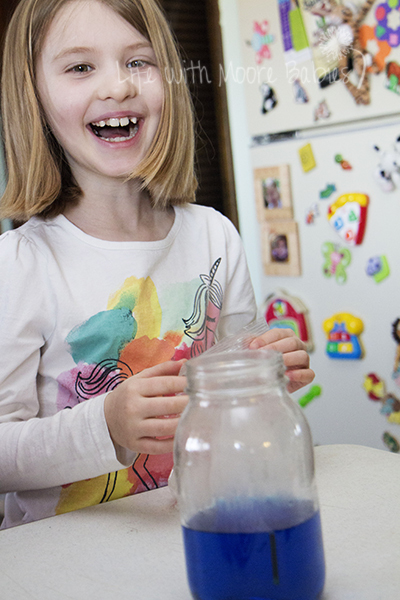 When you make your own cloud you do so by heating the water with the match and quickly cooling it with the ice. 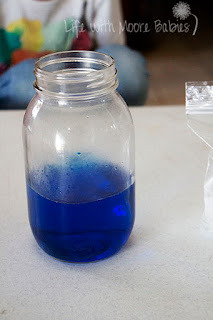 This causes the air to condense above the water level just like a cloud. The jar simply contains and concentrates your cloud so you can see it. 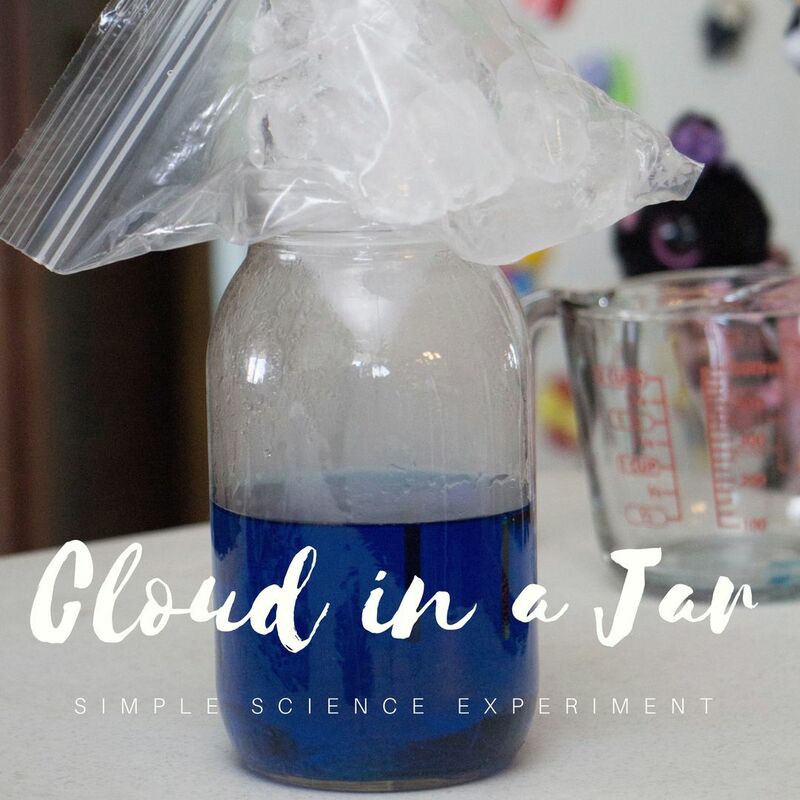 It may not be shaped like a unicorn, but this hands-on science experiment lets you, quite literally, get your hands on a cloud. Now take that mason jar and experiment with even more weather!